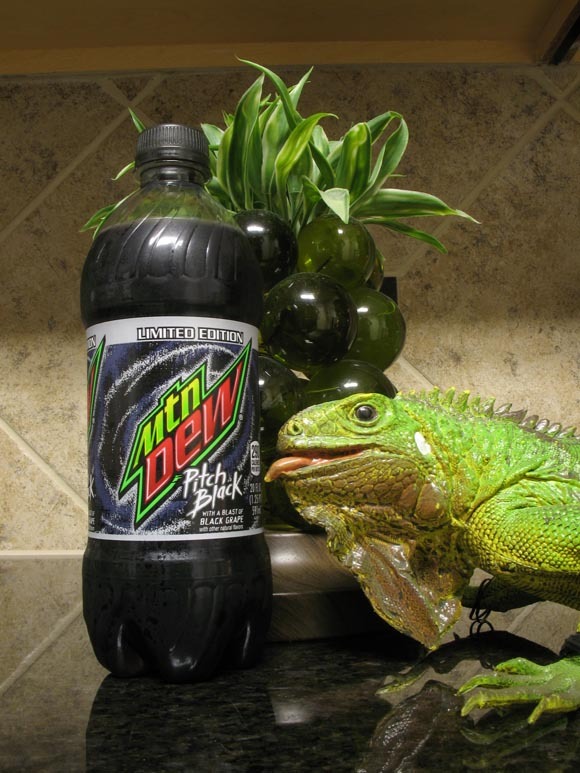 So apparently being a soda reviewer I’m supposed to review this limited edition Mountain Dew Pitch Black. As I understand this beverage has quite the following and it seems that it’s high time that I jump on the bandwagon. Back in 2005 I tried to jump on the pseudo-bandwagon when Pitch Black 2 came out. I feigned all of the excitement one might have seen since I never got the chance to try the original. Pitch Black 2 was alright but nothing cult worthy to me so I figured that the original must have been heads and tails above its sequel. If only I had some sort of way I could travel back to 2004 and give the original a try. Well looky here! Thanks to Mountain Dew… or should I say Mtn Dew (I will never say “Mtn Dew” again in this review because it’s asinine) I can now experience what I originally missed all without the help of a Delorian… which of course is points against. The label is a very extreme purple matching the color of the beverage itself. I really wish I had a black light to see if this bottle could truly be fantastical. Ah well, time for a whiff. Ok… so that’s not quite what I was expecting. The scent I was greeted with was that of citrus and grape… heavy on the grape fortunately. Based on scent alone this is Mountain Dew with grape flavoring, oddly enough the label clearly states that this is Pitch Black with a BLAST of BLACK GRAPE. I figured this was Mountain Dew with a blast of black grape but what do I know. I’m kind of curious what Pitch Black would taste like without its blast of black grape but we’re not here for that today. What we’re here for is transporting me back to 2004 so that I may experience the apparent amazement that is Mountain Dew Pitch Black… and so we shall. Interesting. This isn’t nearly as EXTREME as I thought it would be but I find that’s working out for the experience thus far. Instantly I can rank this as a Top 2 Dew for me. I’m not sure what would come first but this and Code Red are now neck and neck. Upon the first sip your tongue is immediately met with the knives of a thousand citrus flavored carbonation bubbles. After the bubbles lay down their arms the grape, apparently black grape, flavor shows itself. It doesn’t show in an extreme way like your uncle (it’s always a creepy uncle isn’t it?) at the last family gathering though. Instead, Mountain Dew Pitch Black raises its hand, gets called upon, and casually states that “Yes I’m a Mountain Dew with grape flavoring”. I realize that Mountain Dew tries to cater to an extreme/gamer/youthful audience but their flavors don’t bring that out in me. Maybe…maybe I’m old now and just “don’t get it” anymore. Ah well, if I “don’t get” Mountain Dew’s marketing I’m probably over thinking it. Why did I go off on that mini-tangent? Must be time for my old people pills. Back to the beverage at hand. I’m finding myself really enjoying Pitch Black and wish that I’d been on this train when my love of Mountain Dew was at its peak. Like I said earlier it’s up there with Code Red in my opinion and I used to be a fiend for Code Red. One of the strengths of the Mountain Dew brand is that they aren’t afraid to try and create Frankensteinesque sodas that combine the already popular Dew flavor with that of grape, orange, white stuff, etc. This of course results in the occasional monstrosity but gives people even more reason to buy Dew products. Pitch Black is good. I’m good with this. Of course it’s full of chemicals and that will hurt the score a bit but I can tell you that I’ll be looking for Mountain Dew Pitch Black again next year. Now… who do I talk to about Surge, Crystal Pepsi, and the original Sprite Re-mix? Twist, of course, is the only one extreme enough to be that close to the label.